Around the world, researchers are attempting to shrink data storage devices to achieve as large a storage capacity in as small a space as possible. In almost all forms of media, phase transition is used for storage. For the creation of CD, for example, a very thin sheet of metal within the plastic is used that melts within microseconds and then solidifies again. Enabling this on the level of atoms or molecules is the subject of a research project led by researchers at the University of Basel. The physicist Aisha Ahsan, lead author of the current study, has now added individual Xenon gas atoms to the holes, which are only a bit more than one nanometer in size. By using temperature changes and locally applied electrical pulses, she succeeded in purposefully switching the physical state of the Xenon atoms between solid and liquid. She was able to cause this phase change in all holes at the same time by temperature. The temperatures for the phase transition depend on the stability of the Xenon clusters, which varies based on the number of Xenon atoms. With the microscope sensor she has induced the phase change also locally ,for an individual Xenon containing pore. "We will now test larger molecules as well as short-chain alcohols. These change state at higher temperatures, which means that it may be possible to make use of them," said Professor Thomas Jung, who supervised the work. 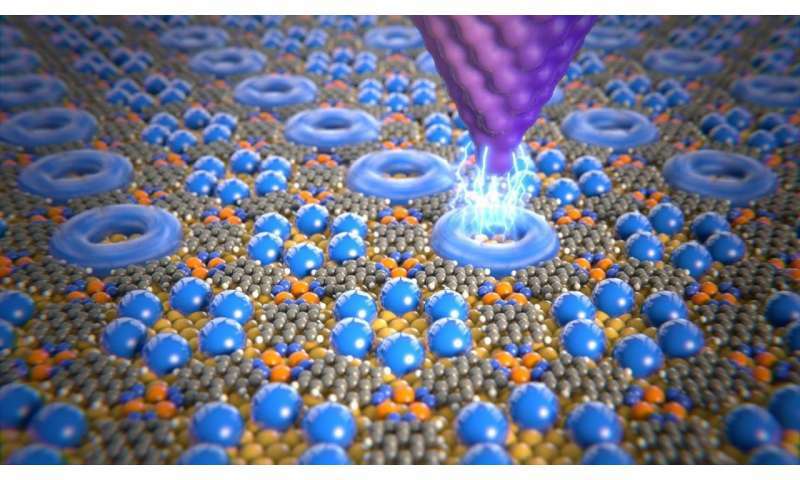 Graphic animation of a potential data storage device on the atomic scale: a data storage element—made of only six Xenon atoms—is liquefied using a voltage pulse.